Back in 2003 I picked up a copy of The Postal Service’s, seminal debut album, Give Up. In my head it was Ben Gibbard from Death Cab For Cutie playing with some electronic musician. That guy was Jimmy Tamborello of Dntel and that collaboration was incredible. Ben’s emotive vocals and heartbreaking lyrics paired, with a glitchy, electronic backing, were a match made in heaven, as were the beautiful female vocals. Those female vocals were my first exposure to Jenny Lewis (and also my first exposure to Jen Wood, who sings the female parts on Such Great Heights & Nothing Better, and recently appeared on Sun Kil Moon’s brilliant album Benji) Jenny would reappear on my musical radar a year later via a track I still consider the greatest thing she’s ever done. That track was Portions For Foxes by Rilo Kiley, it appeared on their 2004 album More Adventurous. From the opening ringing note, via a delightfully energetic guitar line, you arrive at the opening line “there’s blood in my mouth, because I’ve been biting my tongue all week” In terms of 2000’s indie club floor fillers, there are few, if any, better moments. Just about still in my teens, screeching “I’m bad news” was probably highly unconvincing, but it was a hell of a lot of fun. It is ten years later, we’ve all moved on, but like an old flame, you never forget the day you met a singer like Jenny. The Voyager is Jenny Lewis’ first album since 2008’s Acid Tongue, although that’s never an easy thing to categorise for an artist who takes on as many guises as Ms Lewis. 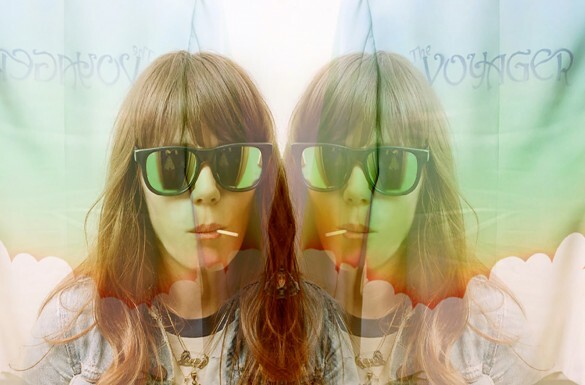 Collaboration comes naturally to Jenny, be it as the frontwoman of Rilo Kiley, sharing the limelight with Jonathan Rice as half of Jenny & Jonny, or teaming up with The Watson Twin’s. None the less even by her own standards, The Voyager is an album with a huge supporting cast, featuring members of (deep breath) Maroon 5, Dawes, Phantom Planet, First Aid Kit, Rilo Kiley, Bright Eyes, The Watson Twins and The Heartbreakers. That’s before you even get to her four producers Beck, Ryan Adams, Jonathan Rice and Mike Viola,who’s worked with, amongst others Ryan’s wife Mandy Moore. It reads more like a fairly impressive festival bill rather than album credits. It’s her collaborations with Beck & Ryan that are the most eye catching, with the inevitable worry that celebrity producers are brought in less to make the most of the songs, and more to get the most attention for them. The fact that Beck’s efforts are limited to a single track is a great shame, it has all the makings of a fascinating collaboration, and the result is the albums sparkling lead single Just One Of The Guys. Lyrically it’s a dream, full of the kind of open to interpretation statements that mean a new reading can be established on almost every listen. Is it a feminist anthem, demanding more girls be given a chance in the music industry; a discourse on the ageing process and the pressure a woman feels to be a mother; a dismissive glance at how her friends have given up on the lives they had to live the traditional female role; a simple glance at how touring impacts on a woman’s life? It’s a fascinatingly open ended piece of writing! Musically the presence of Beck is notable, and not just for the fact his distinctive vocals lend a delightful touch to the chorus, the intro with it’s echoing acoustic guitar and heavily produced drum beats, is a harmonica solo away from being pure Odelay era Beck, or perhaps even more so it’s highly reminiscent of his work with Charlotte Gainsbourg. The chorus is a delightful melodious sway, over what sounds a touch like a lute, the whole thing is a brilliant, unique, ambitious song, as good as anything in her career to date. The majority of the album was recorded at Ryan Adams’ PAX AM studios, using the house rules, straight takes, no listening back to the recordings until the next day. It’s a fascinating way to work, and on occasions the collaboration is a roaring success. Take The New You, a fabulous slab of Americana, that undeniably recalls Gold-era Ryan Adams. It starts with the delightfully self-absorbed lyric “when the twin towers fell and it all went to hell I knew you’d be leaving me soon, it’s what tore us apart you perfected the art of making it all about you.” It unwinds to the sound of hushed acoustic, and warm, gently unwinding country licks on the electric guitar. She sounds every bit the convincing country starlet! Elsewhere there’s sadly a few real duds, Love U Forever is as bad as it’s title, cheesy, dull, and the quality of her vocal performance is it’s only saving grace. Whilst You Can’t Outrun ’em, produced by Jenny & Jonathan Rice, is a terribly dated sounding country ballad, which should have been left firmly in the 80’s. Both tracks are quite jarring against the quality of the songwriting elsewhere. Late Bloomer, reads like a Paul Auster novel, all teenage adventuring, and unrequited love, set to a soundtrack of jangling, acoustic country music. It tells the tale of 16 year old Jenny travelling to Paris, and falling for Nancy from Boston who “got in trouble very often” and then getting jealous as Nancy found “the writer of a song that made her shiver.” As a tale of unrequited, unexplored teenage crushes it’s a delight. Like Rufus, she also knows two key rules, save the best to last and from great pain, comes great art. The Voyager is just that, the closing track is unquestionably the best track on this album. An absolutely stunning cross-breed of Alvvays and First Aid Kit, choruses soar on the back of spacy organs, the verses are carried by delightfully understated string sections, and the production is absolutely perfect. The vocals are given a slightly, under-produced feel that gives it a stunning intimacy and warmth. It feels the closest you ever get to seeing into the real Jenny Lewis, and makes you wish there were more of these moments elsewhere. For all the highly polished pop-songs and radio-friendly unit shifters, it’s the rawest moments here that are the best, perhaps sometimes she’s just trying too hard.